The story of how I joined Johns Hopkins Institute for NanoBioTechnology (INBT) is actually one of those moments where it just hits you – Why haven’t I thought about doing this before? It started with me being back at home during the winter of my sophomore year, meeting friends of my parents and answering the most common question: Where do you study? One of the reactions that stuck with me the whole night was “Wow, how does it feel to be in the center of the most cutting-edge research?” This made me realize how I’d been oblivious to one of the things I would love to get involved in. Better one and a half years late than never, I decided to join the research bandwagon as well. I started going through the profiles of labs on Homewood campus, looking for a topic that would make me want to be there in lab every free minute during the year. I finally found one that sparked my curiosity: the Denis Wirtz Lab. Dr. Wirtz is the Smoot Professor in the Department of Chemical and Biomolecular Engineering and also the University’s Vice Provost for Research. Though at the time most of the stuff I read about the Wirtz lab went over my head, I knew that cancer was something I had always wanted the world to be rid of. Seeing near and dear ones succumb to it was one of the most excruciating things which I wanted no one to experience in the future. Fascinated by the approach taken by Dr. Wirtz, I shot him off an email and to my amazement, I got an email back within the hour, “Sent to my grad students, look forward to working with you. d”. The next day I was scheduled to be back in Baltimore, and the day after that, I was a part of Wirtz lab. During my training, I remember asking one of my peers “How in the world can I remember all these procedures, let alone do them?” She simply smiled and said, “You’ll see”. In a few weeks, I found myself doing those very procedures, one step after another as if it were a reflex action. I would most definitely attribute me being able to do this to my grad student Hasini Jayatilaka (don’t kill me for calling you out!). At the end of the day, what I felt it boiled down to, was realizing that the person I work for was in the same shoes five-seven years ago as I was now, and she wouldn’t expect anything unrealistic out of me. Once you embrace the challenge ahead, knowing that there is no need to be intimidated, you’re good to go. The best part of being involved in research, apart from the work you do, is sitting in class in a lecture hall and suddenly tune in to the professor talking about something that you do in lab each day. That moment cements your understanding of why you did what you’ve been doing for so many days, it connects the dots in your mind, and that moment is when you’ve completed the full circle between theory and practice. 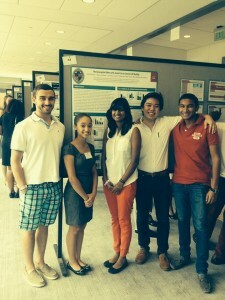 Our team at a poster presentation over the summer. For me personally, having to come to lab got me into a disciplined schedule. I had a fixed time for all days of the week now to wake up (which for me used to be the latest possible time before), since if I had no morning classes, I was in lab. It helped me a lot with my time management skills, with me cutting down on TV shows and sporadic naps. To my surprise, it did not affect the amount of time I spent with my friends, as the reduction in TV shows and naps was (extremely) disturbingly enough to keep every other aspect of my daily schedule the same. Being surrounded in lab by people in similar academic disciplines also gets me a ton of advice on classes. It’s like my own little “rate-my-professor” that encourages me to definitely take some class if it is “the best class I will take at Hopkins”. At times, it’s also a ‘learning den’ where I can get help with classes if I need to. Getting involved in a research lab also came with social outings with the team, with our dinners enabling us to get to know each other on a more personal level. I feel that this in a big way contributed to the chemistry we have while working with each other, made us comfortable spending time with each other at work. At this point, after nine exciting months, including a fully lab-packed summer, I feel that this continues to be one of the best decisions I made so far. I do not regret being here every day, but take pride in saying “I need to be in lab”. One of the most cherished take-away for me is developing a sense of accountability for my actions, which I feel is an important aspect in life. I would definitely encourage being involved in research while at Hopkins as you have nothing to lose but so much to gain. 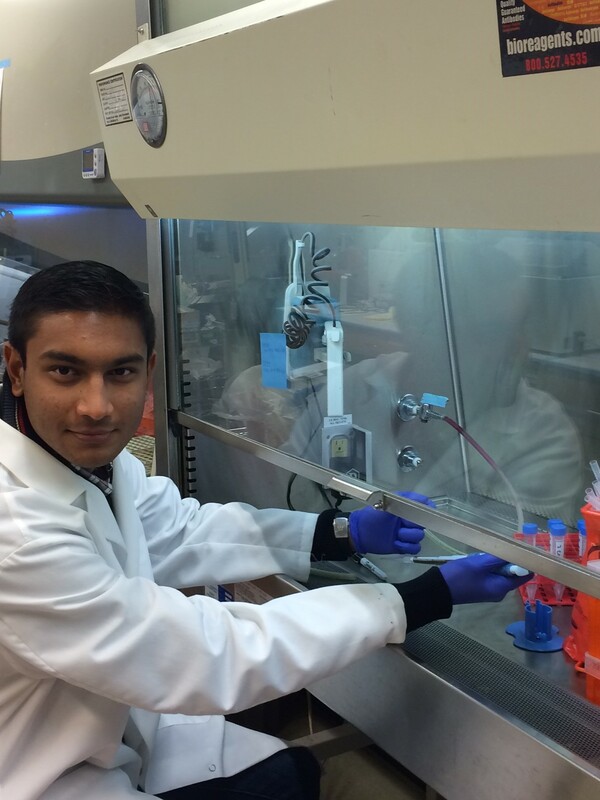 Pranay Tyle, is a junior in Chemical and Biomolecular Engineering minoring in Economics, and hopes to one day manufacture low cost medicine accessible to those in dire need across the globe.